August | 2012 | So.....What's the Point? The overwhelming holiness of God’s Presence was revealed to Israel time and again in the Old Testament and finds its fullest expression in the Tabernacle, the Levitical priesthood, the sacrificial system and the Day of Atonement. Together they made it clear that Israel’s sin made them unholy and separated them from the highest holiness that was Yahweh. Only by the shedding of blood could they be cleansed so His Presence might dwell among them, there between the Cherubim above the mercy-seat of the Ark of the Covenant in the Holy of Holies. 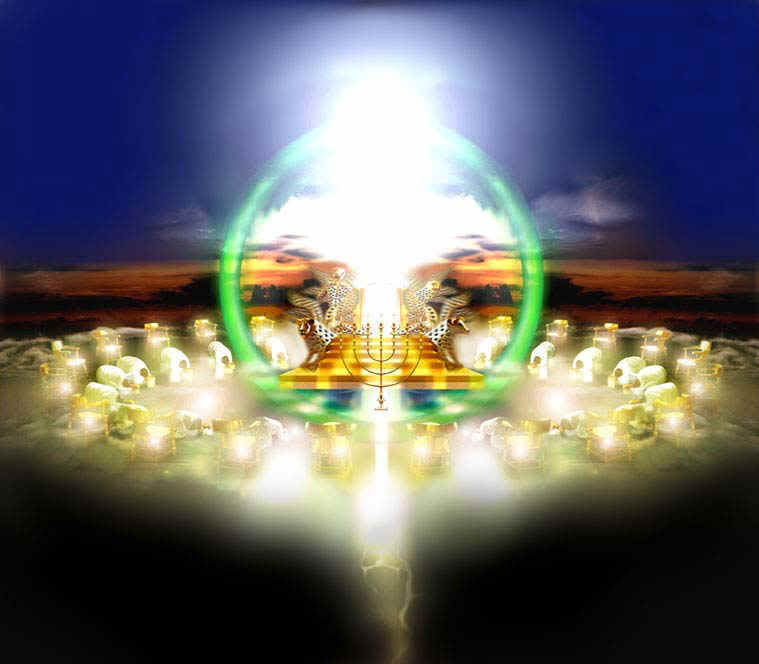 But only the high priest was allowed entrance into the Presence, and that only once a year while the rest of the people remained outside the Presence. The Book of Hebrews argues that the Tabernacle, the priesthood and sacrifices were shadows, copies of things in heaven and that Jesus Christ is the Reality of which they spoke. He is both Sacrifice and High Priest of the New Covenant. It is His blood He presents to God, shed for the sins of the whole world, as a complete, never-to-be-repeated event by which propitiation is made and mercy available to all who humbly seek it as did the Publican we read about in Luke 18:13. So now, based upon all this, we are admonished twice in Hebrews (Heb.4:16 and Heb.10:22) to come into the Presence, to approach God’s throne. Entering the Presence is the most profound of all privileges we enjoy as Christians. And, unlike Israel, everyone who believes is invited for we all have been made priests and kings by His redemption. It is also the most terrifying because in the Presence we are enveloped by holiness, by an unimaginable purity and by Light in which nothing, absolutely nothing remains hidden. In both verses, the Greek verb translated “draw near” is the same and in the present tense meaning a continuous action accompanied by intention; i.e. I purpose, consciously decide with full awareness to draw near all the time. Furthermore, each invitation is a conclusion to an argument the writer is presenting. Heb.4:16 (and continuing on in chapter 5 forward) show that Jesus is superior to angels, Moses and Joshua. Jesus is our Great High Priest and so we must enter the ‘rest’ God has provided through Him. Heb.10:22 concludes that the New Covenant takes precedence over the Old, again based on the superiority of Christ’s redemptive work and, again, because He is our High Priest and so we must ‘hold fast to the confession of our faith’. Entering His rest and holding fast to our confession, then, are possible because of His great mercy embodied in the High Priestly ministry of Jesus and the reasons for ‘drawing near’. We dare not measure ourselves, our successes, our blessings, our churches against any other standard than the holiness of God. And when we are properly measured, we find ourselves weak, always tempted, ignorant, misguided (Heb. 2:16-18; 5:2) and in desperate need of our High Priest. But of all these, weakness stands out, at least to me because it is in such stark contrast to the prideful, arrogant, self-sufficient, independent and merciless ideals the world holds forth. To know our weakness is a deeply moving insight. It is the true condition of human existence, this frailty, fragility and tenuous life that is only a breath, a heartbeat away from ending. Most importantly, it is something Jesus knows about us because He, too, lived as a human being. Our greatest weakness is failure to live according to the righteousness and holiness of God; it is a moral weakness brought about and increased by every act of sin. Because we are weak in this regard, we need rest, a rest from striving to do what is impossible, namely to be holy and accepted by God through our own efforts. Such was the lesson of the Law, the Levites and the Incarnation; we cannot keep the Law and we need blood sacrifices to secure God’s mercy. Having the final and complete sacrifice of Jesus, Christians can now rest in His merciful grace. We must “labor to enter into that rest” not by trying to please God by our own efforts but to resist any temptation to please Him except by grace and faith. And so Heb. 4:16 tells us to draw near in times of need because Jesus “sympathizes with our weaknesses” (Heb. 4:15). What is remarkable about this word ‘sympathy’ is it means not just having knowledge of human weakness but actually feeling that weakness because the one sympathizing has experienced the same. And, what’s more, one of the primary meanings of ‘mercy’ is to have sympathy towards someone who deserves otherwise. The writer of Hebrews tells us we are to “come boldly to the throne of grace” (NKJV) so we can receive “mercy and find grace in time of need.” Boldly doesn’t mean frivolously, irreverently, arrogantly, or because of something we think worthy in ourselves; such boldness is based solely upon the Great High Priest and what He has done and continues to do for us. We can be bold (or ‘confident’ NASB) because He is at the right hand of the Father, a propitiation for us, an Advocate (as we learned last time), and Intercessor, One who feels what we feel, a merciful High Priest indeed. When do we have need? All the time, dear Christian and in every conceivable part of our lives. This is why the verb “come” is in the present tense. We are to come always because we always need. It is pride that tells us otherwise, that we can ‘handle it on our own’ or at the other extreme, a sense of unworthiness, that we’ve visited His Presence too many times already. In both cases, and all others that we might dream up, pride is revealed by the “I” that can handle it or the “I” that is unworthy or the “I” that is of concern in any circumstance. If we are genuinely convinced of what we are apart from Him, then we dare not hesitate for a moment to enter the Presence where He, our Great High Priest, lives to make intercession for us. Here grace and mercy join together and we are forgiven our many sins and find compassion, pity, sympathy, not condemnation or rejection. The sinful self that deserves the full weight of God’s judgment is now transformed into the image of His Son, until as C.S. Lewis says “we finally have faces”, and our true person, our true ‘humanity’ as a son or daughter of God, is revealed. I think for many Christians, including myself, the sheer magnitude of this invitation to “draw near…” (NASB) the Presence, or being in the Presence, escapes us. A question worth considering is this: what, exactly, do we draw near to during the course of a common day filled with common needs? Is it God or some kind of substitute, even a religious one, like a church, a pastor, or a doctrine? Or worse, is it a worldly preoccupation we hope will deliver us, like money, power, celebrity, or possessions? Israel enjoyed the Presence in their personal and national experience yet, over and over, they pursued other gods, ones they could ‘see’, that appealed to their senses and sensuality, ones that appeared more real than the Presence hidden in the Holiest of All. The Hebrew Christians to whom this book was written were suffering social and economic rejection by their peers, and were tempted to ‘go back’ instead of ‘drawing near’, to return to the shadows instead of remaining in the Light and so the encouragement to“…draw near”. However we answer this question know this: there is no mercy to be found except at the mercy-seat where the blood of our Sacrifice and High Priest makes clear the path to the Presence. It is up to us to ‘draw near’ with confidence and know our weakness is no longer a barrier but the way to experience His power (2 Cor.12:9). 1 John1:7-2:2 shows us the dynamic interconnectedness between our association with Jesus (walking in the Light), confessing our sin, being cleansed by his blood, His propitiary sacrifice (mercy), and His Advocacy on our behalf all of which, like a mirror, reflect facets of God’s mercy. We learned last time from Leviticus and the elaborate sacrificial system described there that in order to enter His Presence the people, especially the High Priest, must be made clean from all things unholy. This required the shedding of blood, a great deal of blood. Cleansing by His blood is contingent on fulfilling two conditions: walking in the light and confessing our sin. Although John doesn’t give us a lot of detail about what ‘walking in the light” is, his Gospel suggests that, at the very least, it is fully embracing the Light that is Life (John 1:4) i.e. the Incarnate Word. We get another clue from this letter when he says that hating one’s brother is to be in darkness so it seems that loving one’s brother would place us in the Light, which makes sense. At any rate, ‘walking in the Light’ is a case of association; i.e. as long as we are in His Light, which is tantamount to walking with Him, His blood provides continuous cleansing. The other condition for cleansing is confession of sin. The term ‘confess’ ὁμολογεῖν is from ὁμός, one and the same, and λέγω, to say. It’s a verb in the present tense so the phrase could read “if we keep on continuously confessing our sins…” And note that sin is plural suggesting we all have much to account for. Because part of this verb means “to say’ (λογεῖν) it can be argued that we are to speak the confession. There is something about actually saying the sin that makes it more real, tangible, something that we actually did in thought, word, or deed and not just an abstract memory. Saying out loud “Father forgive me for lying to my boss today” seems more substantial than just thinking “Father forgive my sins today”. It’s like the difference between using a credit card and paying with cash. When I pay with cash the value of the money is much more real to me. Handing over a $100 bill is way different from swiping a card through a machine. With a credit card, it’s more abstract and because real money isn’t exchanged, the financial impact of the purchase remains more remote-until the end of the month when the bill comes. Once confession is made, we are forgiven; our sin is “sent away” and not heard from again, at least on God’s part. Forgiveness is the way of reconciliation because the barrier, sin, is done away with, removed. The forgiven sinner, then, not only avoids God’ wrath but now is embraced by His merciful loving-kindness. But even then residual things hang on the periphery of our hearts, like guilt, fear, anxiety, a sense of failure and disappointment, especially for those who are particularly tender-hearted and keenly aware of their shortcomings. These feelings must be countered by the truth that Christ is our Advocate, our defender. The word ‘advocate’ is from parakletos which is used in John’s Gospel concerning the ministry of the Comforter, the Holy Spirit. John teaches us that one of the activities of the Comforter is to testify about and reveal Jesus to the believer. Here, Jesus our Advocate testifies, appeals our case before the Father, a testimony based on His sacrifice so that mercy may be granted. Placing this idea of Advocacy along with what the writer of Hebrews says of Jesus that He is our merciful High Priest and makes propitiation (hilaskesthai, part of theword group from hilaskomai in Luke 15:18) for the sins of the people” (Heb. 2:17) an even more incredible picture of our Lord emerges. ‘Merciful’ is from eleoo and means sympathy, pity, compassion and the like. You will remember in the first article we learned that the English word ‘mercy’ is translated from different Greek words. This is our first example and eleoo is the most common word for ‘mercy’ in the New Testament. I also pointed out that, in my opinion, all ‘mercy’ no matter the word used depends upon propitiation (hilaskomai). I think Heb. 2:17 supports that opinion. Therefore, Jesus is a merciful High Priest because He is also the propitiation for our sins so the connection between mercy as propitiation and mercy accompanied by propitiation is clear. In our next installment, we will look at the Book of Hebrews where mercy is implicitly prominent when we go into the Presence. Here’s how it works: if the antecedent P is affirmed (the condition met), then the conclusion Q must follow when it is a valid argument; i.e. the conclusion follows necessarily from the premises and can’t be any other way. So 1 John 1:7. “If we walk in the light… then we are cleansed by His blood” or 1 John 1:9; “If we confess… He forgives”. “Walking in the light” is the condition for being “cleansed” and “confessing sin’ is the condition for being ‘forgiven’ and ‘cleansed’. This might seem overly technical, but here’s the point: if the premises of a modus ponens argument are true and the argument valid, then we end up with a necessary truth. Since forgiveness of, and cleansing from, sin is exceedingly important and since we believe The Bible’s claims are true then what John sets before us are necessary truths, absolutes, no wiggle-room claims and, therefore we can, and should, have absolute confidence in their veracity. This is especially useful for those who argue that the Bible is illogical, incoherent and, otherwise untrustworthy. The word for mercy (hilaskomai) Jesus uses in the parable I wrote about in the first article of this series connects the two Testaments regarding the meaning of propitiation. Recall that in the Septuagint translation of the Old Testament, hilaskomai is rendered ‘propitiary’ and by ‘mercy-seat’ in the NASB and NKJV. It is used in the New Testament and translated mercy (only twice Luke 18:13 and Hebrews 9:5) and as propitiation (1 John 2:2 among others). Propitiation, propitiary, mercy-seat; these words all have something in common, namely the shedding of blood explicitly displayed in the sacrificial system of the Old Testament described in Exodus and Leviticus and by the sacrifice of Jesus in the New. Reading Exodus and Leviticus leaves no doubt about the centrality of blood sacrifice in Israel’s worship of Yahweh. It wasn’t something they dreamed up either; God was very, very specific about what was acceptable for worship, what each sin demanded as a sacrifice, how often and so on. The number of animals required by that many people is staggering and the amount of blood shed each day, week, month and year equally staggering. The most important of all the sacrifices was the Day of Atonement when propitiation for the sins of Israel was secured by the blood from the sacrifices being sprinkled on the mercy-seat of the Ark of the Covenant. Upon the merit of the sacrifice and the High Priest’s carrying out the ceremony properly God was justified in granting mercy to Israel instead of displaying wrath. This in turn made it possible to have a continuing relationship with Israel. But note here that the propitiary sacrifice offered was in essence a ‘substitute’ in the place of Israel. God’s wrath/judgment requires the death of the offender, blood needs to be shed, as ‘payment’ for the offense; death is the wage we earn, and deserve, for sinning. But with a substitute, the penalty of death is placed upon it thereby taking the place of Israel in the Old and the whole of humanity in the New Testament. Therefore, in the background of all this, especially the idea of propitiation, is the theological term “penal-substitutionary doctrine of atonement” which forms the basis for what many Christians believe Jesus’ actually was. I say ‘many’ Christians because there are several other explanations for Christ’s death and what it accomplished besides this one that other Christians follow. Perhaps we’ll go there another day, but I digress. Of course, we know from the Book of Hebrews all of this was the shadow of the Reality that would be the shedding of Christ’s blood on Calvary. What we need to see clearly now is that the propitiation upon which mercy rests and that for which the Publican cried out accomplishes two things: the aversion of wrath from the sinner and the reconciliation of the sinner to God, both sometimes designated by the term ‘atonement’. And specifically, we must see that God’s wrath against sin and sinners is real. and were by nature children of wrath, even as the rest. Christians can usually expect at least two reactions to this truth from people in our politically correct and morally relativistic culture. The first is that the idea of blood sacrifice is absolutely barbaric, uncivilized and must be rejected, at least by ‘enlightened’ societies. Their opinion of the Crucifixion is the same; no god worthy of worship would allow such torture to satisfy some standard of righteousness. Second, that God can be characterized as wrathful (along with ideas like a final judgment, hell and eternal damnation) is equally abominable to the sensitive modern mind, especially that of a liberal theologian; after all, they say, “God is love”. Therefore, by association, if you believe a blood sacrifice is necessary for God’s mercy to be granted and without it the sinner will suffer His wrath, then you are an ignorant, uneducated, backwoods barbarian at best. But, even though I expect the world to reject the notion of a wrathful God, I find it interesting that in many evangelical churches it is seldom mentioned; hell, yes, judgment, yes but that God is angry, really angry with sinful humanity? Well, not so much because it goes against the image that God-is-love, the message that gets top billing along with God as a kindly dispenser of goodies. An outsider who first hears about God’s wrath, or reads about it in the Bible might get the impression from such a church that God’s wrath and His love are inconsistent, incompatible, and contradictory; I’m convinced many Christians think exactly like this. But this is for another day to consider. Besides averting God’s wrath against sinners, propitiation as the basis for mercy makes it possible for them to be reconciled with God. The point is important; it is not enough that they escape punishment or His wrath; just as with Israel, God seeks to be brought into a relationship with the offender, a loving, compassionate and forgiving relationship, hence mercy. Add to this the desire of God to actually change a sinner into a saint and provide all the necessary means to accomplish this, the picture of salvation we hear of in the Good News takes shape. Instead of wrath we receive love and forgiveness; instead of a sinful nature we are transformed into the image and likeness of His Son who is our propitiation, even our Mercy-Seat. This is the kind of mercy we can expect from God, even now, and we can never lose sight of the fact that blood, real blood, was shed that we might receive it. Well, this study so far is pretty basic but nevertheless helps us understand what God’s mercy is and our need for it. Next time the practical and devotional aspect of mercy/propitiation will be our topic which is really the most important part of this study. I’ve added a link to a song I find appropriate concerning His mercy-He simply never lets go of us. Control/click on the link and enjoy. To all my followers of “So…What’s the Point?” this study is also being posted on a different blog that is focused more on theology and, therefore, a bit more involved than what I’ve been doing thus far. The new blog is located at drwryzekphd.wordpress.com and is entitled Godtalk-Biblical Theology for the Avid Christian. We are all filled with something, mostly ourselves, or, like some of the Christians at Ephesus, that and way too much wine (Eph. 5:18). The point is that whatever fills us controls us, constantly captures our attention, and occupies our time, efforts, and defines our goals. For Christians, being filled with the Spirit is the only real concern; being filled with anything else is distracting at best, destructive at worst. But what does it mean to be “filled with the Spirit”? One thing we can know right off the bat is the verb ‘be filled’ is in the present tense, imperative mood signifying Paul is not making a suggestion, if we feel like it or when we get around to it, but a command. We can dispense with any procrastination, it’s something we are ‘to do and do it now’. Knowing this is not an option, then, one way to understand being ‘filled with the Spirit’ is through the term displacement and, as a result of displacement, replacement. An instance of displacement occurs when something heavy is put into something light, like a heavy rock into a pail of water. The water is displaced and runs over the sides of the pail. Replacement is simply that the rock takes the place of where water once stood. The importance of being “filled with the Spirit is further reinforced by this observation: fifteen times the word ‘spirit’ (pnuema) is used in this letter and twelve of these refer directly to the Holy Spirit of which 5:18 is one example. We are sealed with the Spirit (Eph. 1:13); we have access to the Father through the Spirit (Eph. 2:18); the mystery of Christ has been revealed to us by the Spirit (Eph. 3:5); we have unity in the Spirit (Eph. 4:3-4); we are forbidden to grieve the Spirit (Eph. 4:30); we manifest the fruit of the Spirit (Eph. 5:9); we have the sword of the Spirit as part of our spiritual armor (Eph. 6:17); we are to pray in the Spirit (Eph. 6:18). We already know that the Spirit is in every believer. The issue of being “filled” is how much of the Spirit you and I have and this obviously depends on how much space there is for Him. I think we all can agree that the Spirit is ‘heavier’ in terms of sheer existence than our ‘self’, that narrow little narcissistic center of consciousness, infinitely heavier in fact. So the more we give to Him of ourselves the more He settles into our lives and the self is displaced and, eventually, replaced with the fullness that is God. To be ‘filled’ is to be so full of the Spirit there is no room for anything else, to the point we overflow and all that emanates from us is the presence of God. Finally, consider how remarkable it is how Paul uses the terms filled and fullness in this epistle, always building upward into the realities of being a Christian, the high point being “filled with the fullness of God” (Eph.3:19). Paul delineates what we have already have and what awaits us in his typical now/not yet logic. Line after line, idea after idea, prayer after prayer, Paul sets forth such a vision that we might run from the sometimes paltry lives we live and start enjoying the riches of His grace and love. It is for us to appropriate, enter into, take hold of what is ours in Christ Jesus and we must want it more than anything else, that very fullness of God that was in Jesus Himself (Col. 2:9). Being filled with the Spirit is being filled with the fullness of God. O Lamb of God, that takes away the sins of the world, have mercy upon me. Some of you will recognize these as liturgical lines from the worship in many churches, the Catholic, Lutheran and Anglican for example. What fascinates, and spiritually moves me are the constant references to mercy in their services and devotional works (like the Anglican Book of Common Prayer). It is a word I hardly ever hear more freewheeling, less structured non-denomination churches; grace, forgiveness, love, redemption, salvation and the likes are spoken of in abundance but mercy, not so much. Are we missing something important by neglecting this word and all it means? The many references to mercy in the Bible along with the theology behind the term make me think we are. It is certainly worth exploring and you’re invited to come along, Bible in hand and heart open to what God will say to us. This study, by the way, is a small contribution to diminishing the dumbness targeted in the two blogs “Dumb Christianity”. I figured I should do something besides just harp on it. In fact, I am considering starting a new blog featuring just Biblical and theological studies that will be more lengthy and complicated than a regular blog. I would like all of you who follow this blog to give me your reaction to this idea. This installment you’re reading is an example of what the new one might be like. This parable contrasts the self-righteousness of a Jewish religious leader with someone who knows what he really is, a sinner needing the mercy of God. The Greek word translated ‘merciful’ in v13 is hilaskomai which is used only here and Hebrews 9:5. It means primarily propitiation and as a verb used here is literally be propitiated. It is also used in the Septuagint (the Greek translation of the Old Testament) where it is translated ‘propitiary’ (Exodus 25:17 for one example of many) and in the NKJV and NASB it’s translated ‘mercy-seat’. 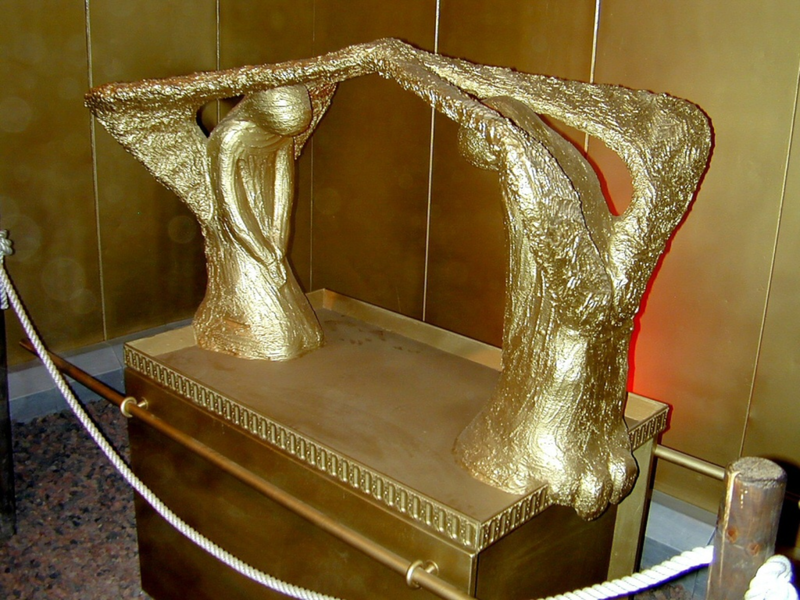 Both renderings refer to that part of the Ark of the Covenant (the gold covering between the cherubim) where the blood of the sacrifice on the Day of Atonement was to be sprinkled thereby covering over the sins of Israel, hence propitiation. Because Jesus used this word hilaskomai for ‘mercy’ instead of the more common eleeo He reveals that propitiation (more on this word later) is the basis for the mercy shown by someone having the authority, the means and the justification to be angry towards and execute judgment against a guilty party. In both the Old and New Covenant God is the offended party, sin is the violation, the sinner is the guilty party, wrath is His attitude towards sin and the sinner, and death the punishment. 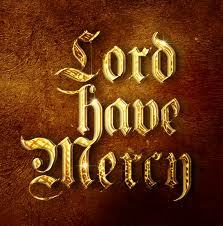 It is each of us and all of us, the whole human race, who need this mercy, or propitiation. What has changed from the Old to the New are the High Priest and the Sacrifice, Jesus being both in this New Covenant. The obvious connection between Luke 18:13 and Hebrews 9, and v5 in particular, become profound in light of the Old Testament sacrificial system outlined in Hebrews, but more on this later. For now consider this: the significance, and even the possibility, of ‘mercy’ designated by any of the other Greek words so translated are based on this one, hilaskomai. Another observation I think is interesting is the use of the article “a” sinner (NKJV) and “the” sinner (NASB) in v13. It is the same article (singular) in both Greek texts, Byzantine for the NKJV and Alexandrian for the NASB yet the translators used different renderings. Rather than trying to decide which one is more accurate, I think both are revealing and both ‘correct’. Taking the NKJV first what is emphasized by “a” sinner is the personal aspect of sin. The Publican recognizes that he, personally is a sinner and in need of mercy apart from anyone else. The NASB “the” sinner on the other hand could denote his being one instance of all sinners and requiring mercy; i.e. a sinner among all sinners. So, even though the article is singular, it could indicate sin ensconced in a single person, or in a person that is part of a single race of persons; i.e. generically. The point is that both renderings apply to the condition of human beings who need propitiation before God. Note that while the Publican admits his personal culpability in sin and the race of which he is part the Pharisee views everyone but himself as a sinner. This attitude has two fatal components found in Luke 18:9 at the introduction to the parable itself: “And He also told this parable to some people who trusted in themselves that they were righteous, and viewed others with contempt.” The first is they trust only in themselves and their own worthiness, not God. Since trust is an essential part of faith, to not trust is to be faithless or unfaithful and without faith it is impossible to please God. The second is having contempt for others who are measured against their own inflated self-worth. The word contempt (NASB and ‘despise’ NKJV) is to “regard as nothing” or treating people as though they are invisible, insignificant, and anonymous. The word is used again in Luke 23:11 where Jesus Himself, the King of Kings and Lord of Lords is treated with contempt and gives us a picture of what it is like. The point I want to make here is that there are many sins but self-righteousness seems to be at the top of the heap and I think for this reason. You well know that the Ten Commandments have two parts. The first four have to do with God and the rest with other people. Self righteousness breaks all the commandments by first replacing God with the idol of self (1-4) and, second, by treating others as if they don’t even exist evidenced by stealing from them, lying to or about them, coveting what they have, destroying their relationships, or murdering them (5-10). The most dangerous thing about a self-righteous people, and Christians can be very, very self-righteous, is failing to see their need for mercy and, therefore, unable to grant it either. This should give us pause to consider how we treat each other as Christians and how we treat those outside the faith. Is it with mercy or do we just ignore people because we think ourselves so….righteous? Something to think about. Well, the stage is set for our next study. Since propitiation is the underlying meaning of mercy in these verses, we’ll ‘unpack’ this word and its use in other important passages. For now, dear Christian, know that mercy is available to us all when, as did the publican, we humbly admit to the Lord our desperate need.